Huge remote control tank pellet shooter for sale. These RC tanks are extremely popular and sell out fast. Please order today so you do not miss out on the hottest tank. Brand new radio controlled tank as seen in the picture above is the LARGEST RC tank for the price with controllable barrel motions made. 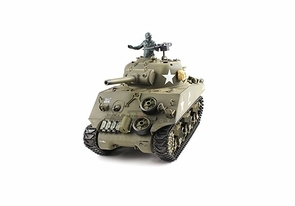 The best style tank RC tank is highly detailed, long, and comes with a 6 channel remote control that is full function allowing movement in any direction. The Tank is also equipped with Super Spin, which lets the tank spin on its axis by controlling the two caterpillar treads to run in opposite directions. This huge RC tank runs on real treads to make it easy to drive on dirt and rough roads. Want more? This amazing remote control tank also makes real smoke, has real barrel and machine gun noises, working suspension, and launches plastic shells for added realism! Buy right now and we will also include a wall charger, rechargeable battery pack for the tank, and extra plastic shells for the barrel. Similar models sell for $500! Buy more than 1 tank and we will send separate operating frequencies for the remote controls for awesome tank battling fun! The RC Tank fires safe plastic shells up to 100 Feet (30 meters) & reloads automatically! You are able to control the Tank to move sideways and the gun to move Left, Right, Up, And Down! Been wanting this tank for over year yes its a toy scale tank but the size alone is worth having it. This baby has a ton of torque went right over logs 4-5 inch ledges up and down. I have climbed up stuff where it was almost at 90 degrees ready to topple over. You can tighten or loosen the spring tension on each wheel if you want more movement and springs but comes at a price the tracks are looser also so you can tighten the wheels where they wont go up or down when it rolls over stuff. I find the pellet shooter strong enough and is so much fun. I would definitely recommend this tank.